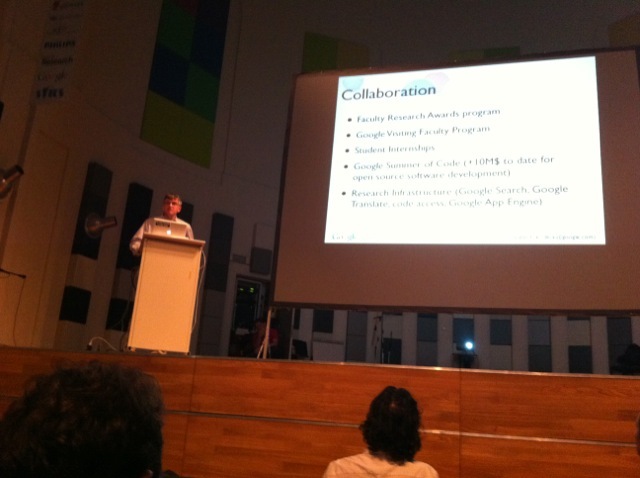 Douglas Eck (Google) (Invited speaker) – There’s no paper associated with this talk. The Bar is already set very high ..
What would you like Google to give back to MIR? ABSTRACT – Most MIR systems are specifically designed for one appli- cation and one cultural context and suffer from the seman- tic gap between the data and the application. Advances in the theory of Bayesian language and information process- ing enable the vision of a versatile, meaningful and accu- rate MIR system integrating all levels of information. We propose a roadmap to collectively achieve this vision. 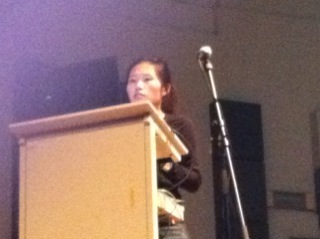 Wants to increase versatility of MIR systems across different types of music. Systems adopt a fixed expert viewpoint ( musicologist, musician). Have limited accuracy due to general pattern recognition techniques applied to a bag of features. Emannuel wants to build an overarching scalable MIR system that successfully deals with the challenge on scalable unsupervised methods and refocuses MIR on symbolic methods. This is the core roadmap of VERSAMUS. 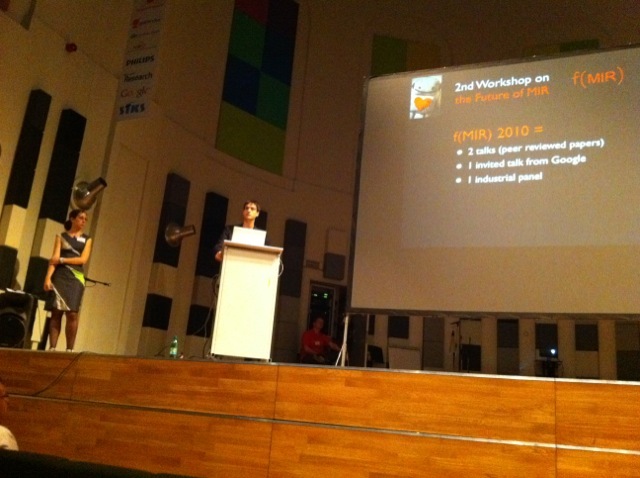 It is the f(MIR) workshop – The Future of MIR – What will MIR be like in 5 or 20 years? ABSTRACT – The hypothesis of the paper is that the domain of Nat- ural Languages Processing (NLP) resembles current re- search in music so one could benefit from this by employ- ing NLP techniques to music. In this paper the similarity between both domains is described. 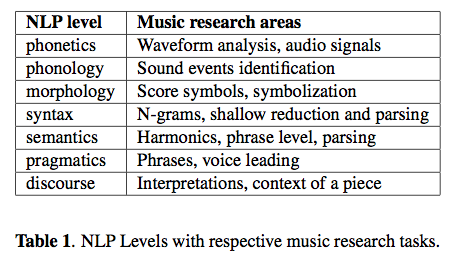 The levels of NLP are listed with pointers to respective tasks within the research of computational music. A brief introduction to history of NLP enables locating music research in this history. 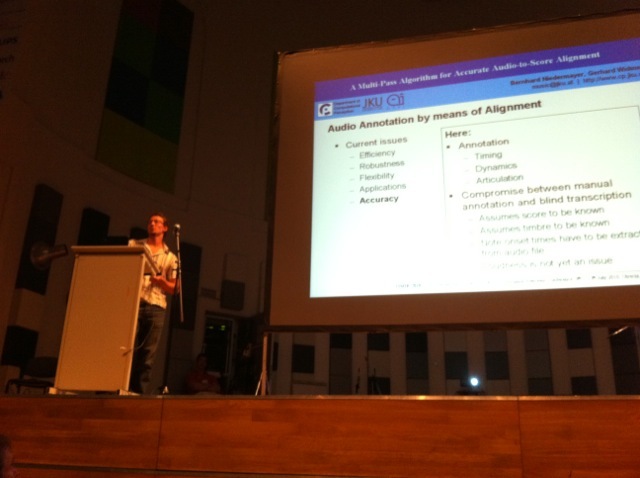 Pos- sible directions of research in music, assuming its affinity to NLP, are introduced. Current research in generational and statistical music modeling is compared to similar NLP theories. The paper is concluded with guidelines for music research and information retrieval. 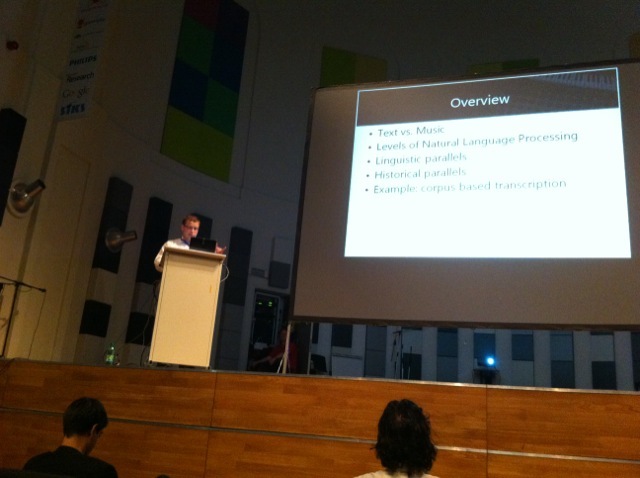 Notes: The speaker points out the similarities and differences between NLP and MIR. Algorithms vs. Data: Algorithms don’t matter much, it is all about the data. More data is better. ABSTRACT – Dynamic Time Warping (DTW) is used to find alignments between two related streams of information and can be used to link data, recognise patterns or find similarities. Typically, DTW requires the complete series of both input streams in advance and has quadratic time and space requirements. 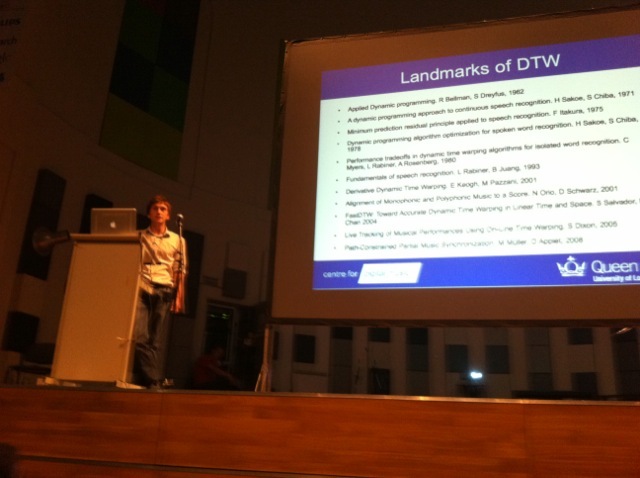 As such DTW is unsuitable for real-time applications and is inefficient for aligning long sequences. 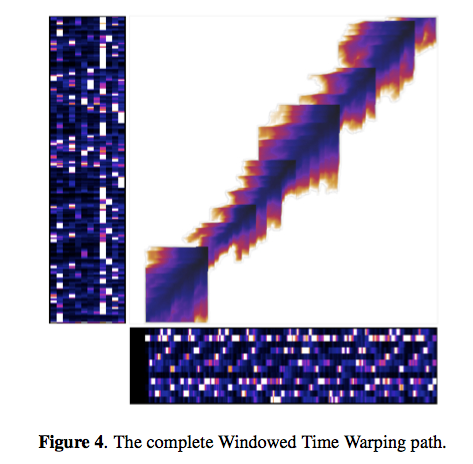 We present Windowed Time Warping (WTW), a variation on DTW that, by dividing the path into a series of DTW windows and making use of path cost estimation, achieves alignments with an accuracy and efficiency superior to other leading modifications and with the capability of synchronising in real-time. We demonstrate this method in a score following application. 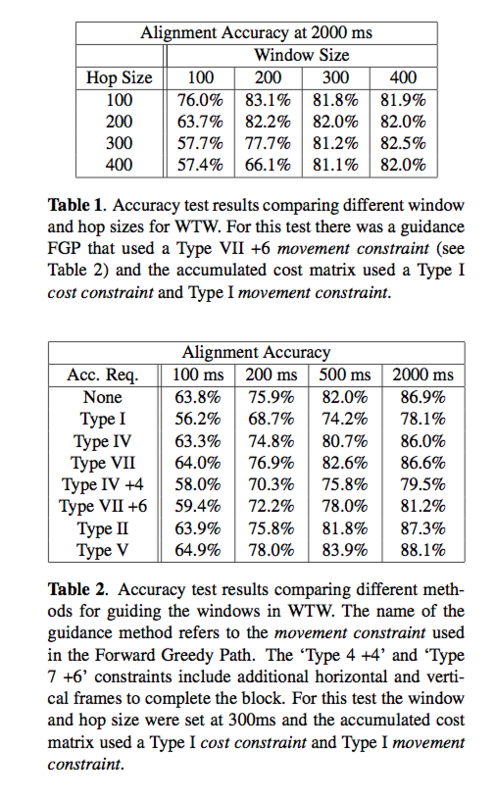 Evaluation of the WTW score following system found 97.0% of audio note onsets were correctly aligned within 2000 ms of the known time. Results also show reductions in execution times over state-of-the- art efficient DTW modifications. Idea: Frame window features – (sub dtw frames). Each path can be calculated sequentially, so less history needs to be retained which is important for performance. Works in linear time like previous systems, but with the smaller history it can work entirely in memory, so it avoids the problem of needing to store the history on disk. Nice demo of a real-time time warping. ABSTRACT – Most current audio-to-score alignment algorithms work on the level of score time frames; i.e., they cannot differentiate between several notes occurring at the same discrete time within the score. This level of accuracy is sufficient for a variety of applications. However, for those that deal with, for example, musical expression analysis such micro timings might also be of interest. Therefore, we propose a method that estimates the onset times of individual notes in a post-processing step. Based on the initial alignment and a feature obtained by matrix factorization, those notes for which the confidence in the alignment is high are chosen as anchor notes. The remaining notes in between are revised, taking into account the additional information about these anchors and the temporal relations given by the score. We show that this method clearly outperforms a reference method that uses the same features but does not differenti- ate between anchor and non-anchor notes. 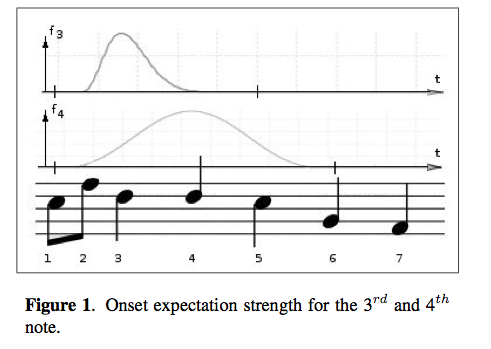 The main contribution is the introduction of an expectation strength function modeling the expected onset time of a note between two anchors. Although results are encouraging, there are specific circumstances where the algorithm fails, i.e., temporal displacement of notes is large. ABSTRACT We investigate the problem of matching symbolic representations directly to audio based representations for applications that use data from both domains. One such application is score alignment, which aligns a sequence of frames based on features such as chroma vectors and distance functions such as Euclidean distance. Good representations are critical, yet current systems use ad hoc constructions such as the chromagram that have been shown to work quite well. We investigate ways to learn chromagram-like representations that optimize the classification of “matching” vs. “non-matching” frame pairs of audio and MIDI. 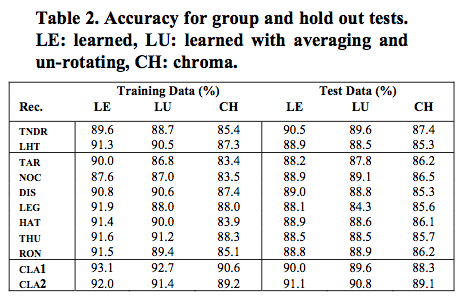 New representations learned automatically from examples not only perform better than the chromagram representation but they also reveal interesting projection structures that differ distinctly from the traditional chromagram. 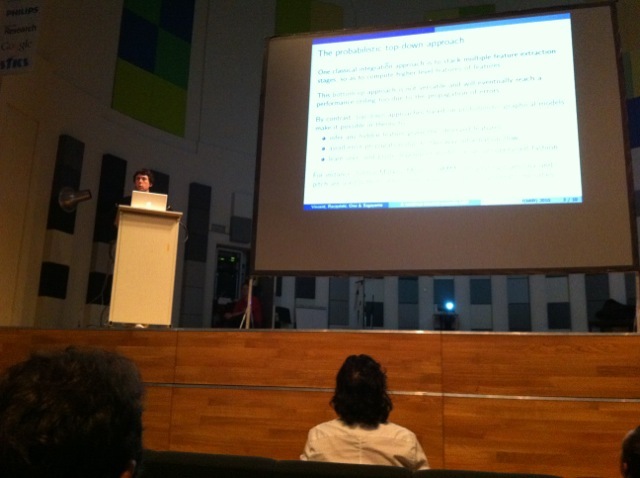 Roger and Ozgur present a method for learning features for score alignment. 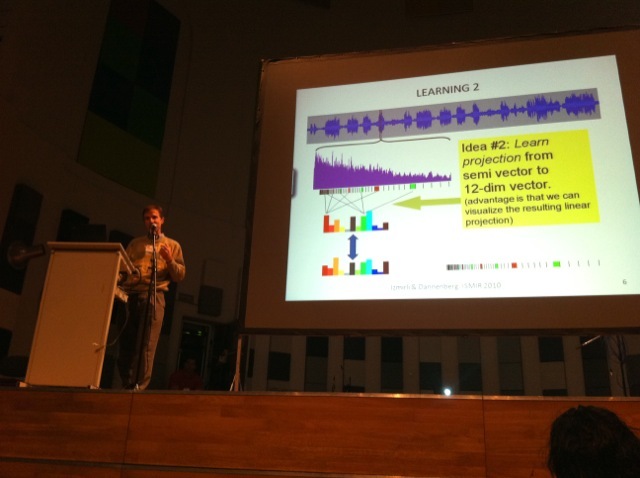 They bypass the traditional chromagram feature with a feature that is learned projection of the audio spectrum. Results show that the new features work better than chroma. ABSTRACT – High-level semantics such as “mood” and “usage” are very useful in music retrieval and recommendation but they are normally hard to acquire. Can we predict them from a cloud of social tags? We propose a semantic iden- tification and reasoning method: Given a music taxonomy system, we map it to an ontology’s terminology, map its finite set of terms to the ontology’s assertional axioms, and then map tags to the closest conceptual level of the referenced terms in WordNet to enrich the knowledge base, then we predict richer high-level semantic informa- tion with a set of reasoning rules. We find this method predicts mood annotations for music with higher accuracy, as well as giving richer semantic association information, than alternative SVM-based methods do. In this paper, the authors use word-net to map social tags to a professional taxonomy and then use these for traditional tagging tasks such as classification and mood identification. You are currently browsing the archives for the music information retrieval category.